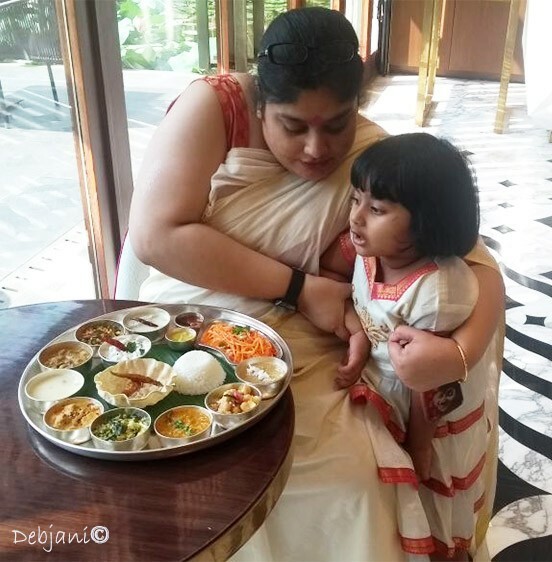 ITC has recently invited me along with the family for the family brunch at Eden Pavilion, ITC Sonar. However, I was not sure whether to opt for it or not! Afterall, I have had gallstone operation hardly 20 days back! though the doctor didn’t advise for any food restriction then there are family friends (and foes) who are always ready to give you suggestion, you want or not! I was not sure whether to opt for the invitation or not! However, when they told me that the invitation was for Onam brunch I took hardly 5 minutes to accept it! I mean who does not want to spend time with the family on a Sunday afternoon over lunch and that too with comfort food! ITC Sonar these days offering Sunday Brunch at Eden Pavilion and they are trying to include flavors and delicacies from each state. 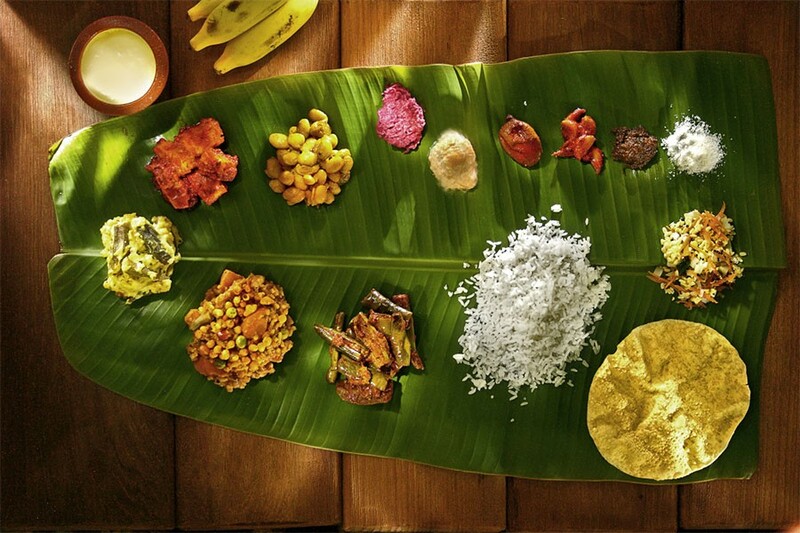 Onam is the Harvest festival of Kerala and is celebrated with vegetarian delicacies. However, as part of the Brunch spread they had several non-vegetarian dishes as well. In fact, both Mehebub and Pasta opted for Non-veg food. From the beginning, Pasta was quite clear with her preference! 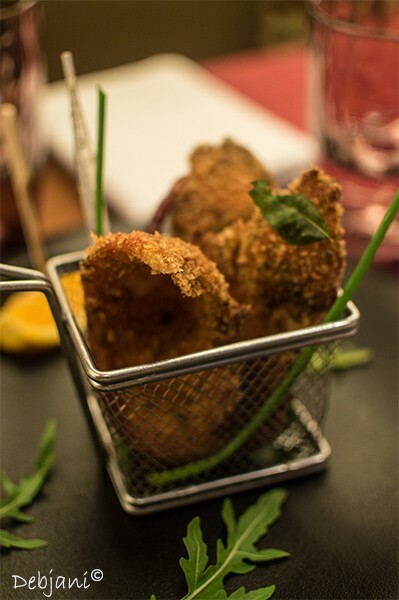 She started nibbling the crumb coated fried chicken flavored with curry leaves along with her portion of Cola! I found Mehebub also settled with the single malt and the prawn starter. They served us a few more Veg and Non-veg starters which were mostly North-Indian that includes Chicken Kebab and Fish Tikka. there were Paneer and Broccoli as well. 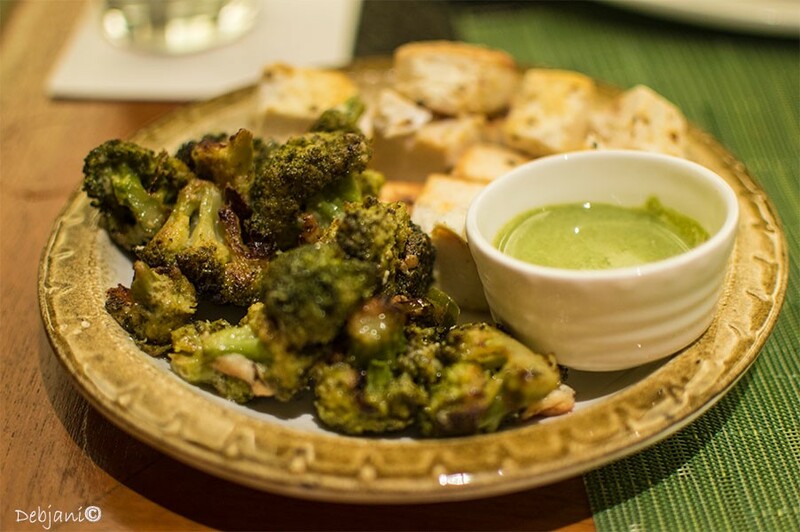 I surprisingly enjoyed the grilled Broccoli a lot! 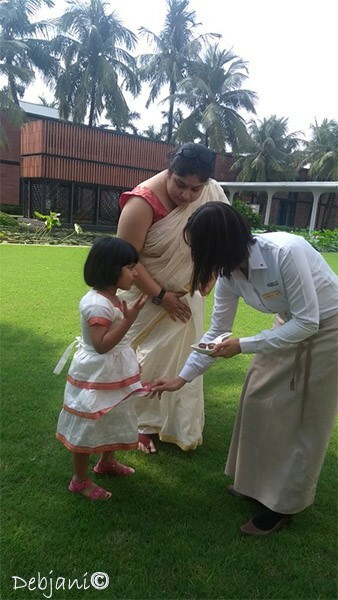 Then there was me, happy to hop and learn from Chef Nikhil about the Onam spread! In fact, I restricted myself to the veg food that day! I always have a soft-corner for Malayali food, be it vegetarian or non-vegetarian. I found the Onam spread itself quite elaborate. Chef informed me that to keep the originality, they used Coconut Oil as medium and opted for the authentic way of cooking. The smell of the tempering with curry leaves, fresh coconut was so very refreshing. 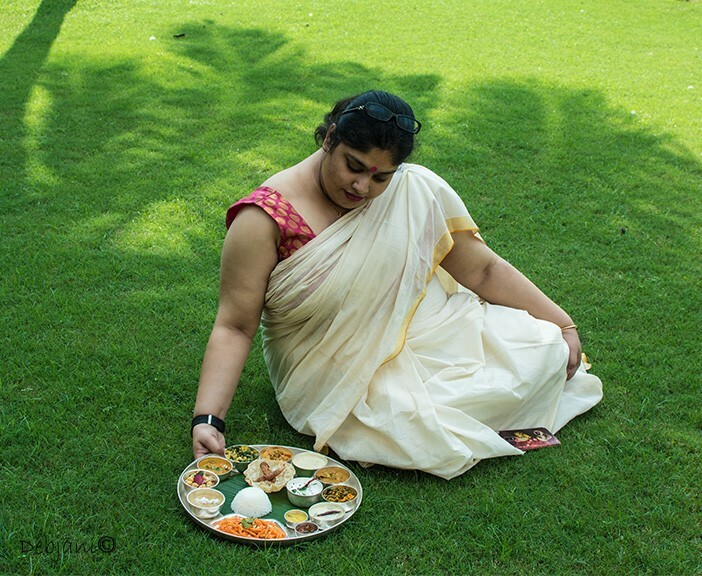 In Kerala, a Sadhya or elaborated thali with around 10-12 vegetarian dishes served on Onam. A Sadhya is incomplete without Rice. and several chutneys and paste; Daal in form of Sambhar and Rasam as well. 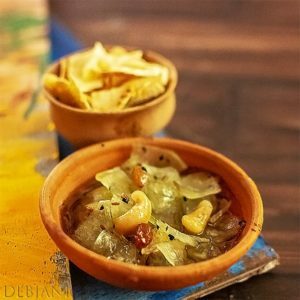 Side dishes such as Avyal, Kootu Curry, Olan, Kalan etc and stir fried veggies and to end with Pradhaman etc. 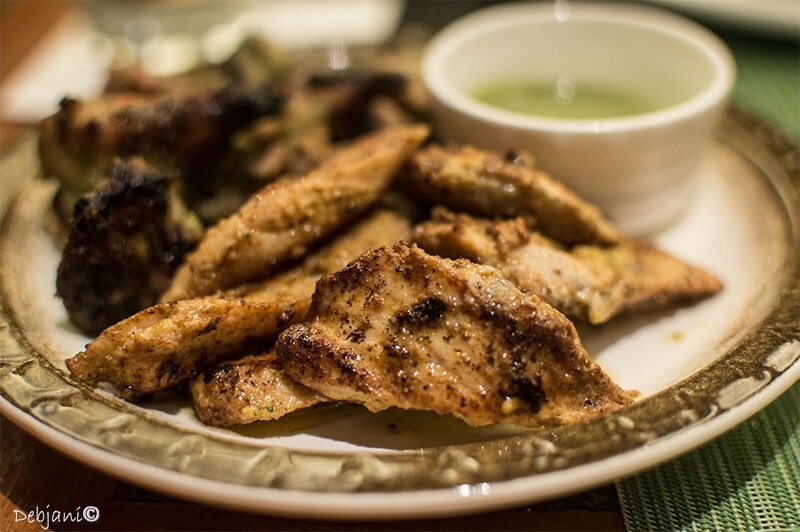 Traditionally they serve it on a Banana leaf along with a must serving of Banana. 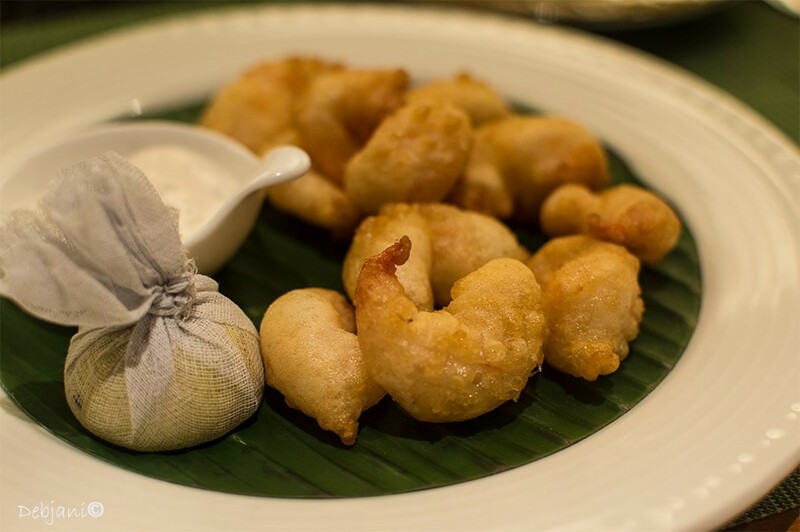 To start with there was Sambaram or spiced buttermilk along with the Salted banana chips or Kaaya Varuthathu. I found both the tangy Tamarind & ginger chutney or Puli Inji and Poppadom and Manga Kari refreshing. Thanks to the horrible operation; I have restricted myself from extensive movements. Naturally, I requested for a Thali. The Malayali spread was part of the brunch. However, it worked better for me. 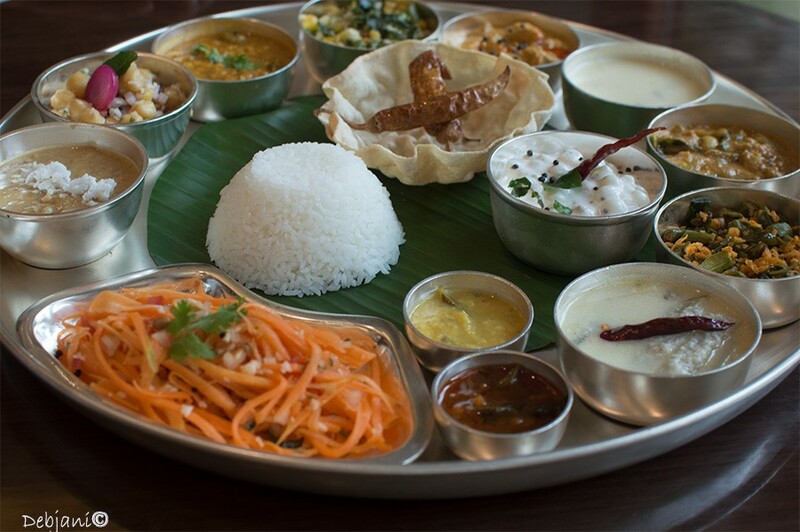 For me, the thali was almost like the traditional plating, though not on a banana leaf, but nice. The Thali was having the above-mentioned chutney, Poppadom, and Manga Kari. Then there was Rice along with several delicacies from Kerala followed by the Pyaru Thovaran ((Runner beans tossed with a coarse paste of coconut & chili). Along with the Sambhar, there was another thick lentil curry known as Parupu Thalichathu. I have tasted the Kootu Curry which was a coconut based veg curry along with the Aviyal, the famous Malayali side. There was a pumpkin side known as Olan which I found really refreshing. though I am not a fan of Raw banana, however, the Kalan prepared with the same and Yam was worth having. the stir fried beans with coconut and chili, Beans Mezzuku Peratti was comforting and so was the Pachdi. Finally coming to the desert, I had the Pal Adai which was a rice and milk based dessert and Parippu Pradhaman which was lentil and jaggery based. I found the latter a bit strong and earthy. However, both the dessert were comforting and perfect for my bong taste-bud. We and especially Pasta had enjoyed the relaxing brunch. They Pampered Pasta badly and believe me she enjoyed that a lot! The environment was just perfect for my kid! She enjoyed her two portions of ice cream. 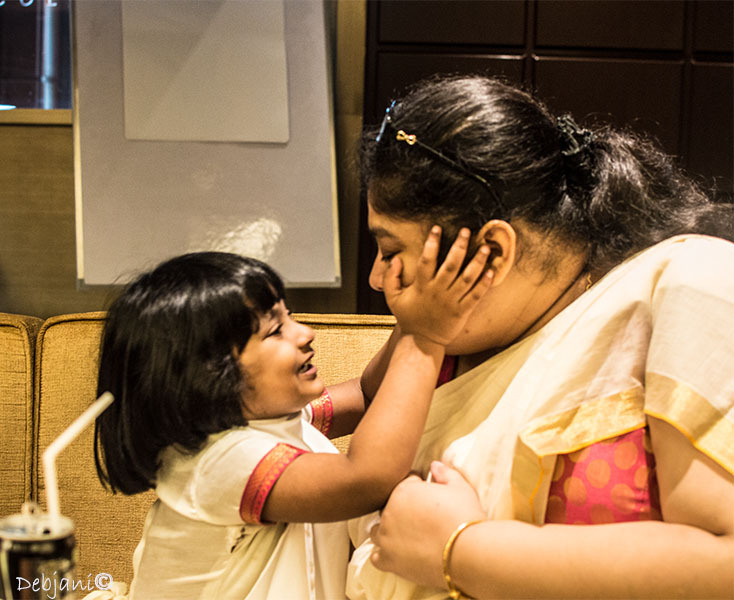 She was happy with Paneer bites followed by the meeting with the chocolate auntie from Fabelle. My munchkin is well aware of the lobby and the green outside and even the small water body there! Now you can imagine what she did there! Now let me finish the post with the required details so that you can plan your Sunday Lunch there! I found the Brunch arrangement just perfect for quality time spending with the family. Disclaimer: ITC Management invited me and my family for the Sunday Brunch at Eden Pavilion.